All many [high school students] know is rote learning, and fear of mediocre standardized tests and grades. No vital connection between learning and life has been forged in our schools, much less any affection for voluntarily using one’s mind in the rigorous, sustained and frequently counterintuitive way that leads to innovation and the advancement of knowledge. But our colleges and universities do pitifully little about combating student passivity and absence of curiosity. … Since the specialized and competing interests of faculty from disparate fields seem hard to reconcile, all but a handful of institutions fail to have significant programs in undergraduate general education designed to equip students with serious skills, inspire them to raise their sights and help them discover what they might be interested in. Partly I wonder if things are as bad as that. I suspect that on a large number of campuses you can find both deeply engaged students and students who aren't learning much. As one Twitter friend said of Wilson's article, "Always mildly suspicious of decline narratives. Faults don't ring true." But I've also seen that lack of interest in one's own education in quite a few students myself. (Not so much since I became a librarian; the students I see in the library tend to self-select for engagement with learning.) It used to depress me a lot back in my previous life teaching freshman writing. There were always students who were interested in the larger world and who seemed to like learning new things, but there were also always students who just didn't seem curious about anything. And it was the lack of curiosity that really worried me, partly because I don't think you can really get an education with that attitude, partly because it just seems like a dull and miserable way to go through life. So I've been thinking about how to foster curiosity in students who maybe have never been encouraged to be curious, and what libraries might do about it. I would love to see some kind of program for small, customized research projects along the lines of "Figure out something you're interested in. Explore that topic. Talk to your librarian about how to do that. Let your exploration take you into other subjects you wouldn't have thought to investigate. Then talk to your fellow students about what you've discovered." Libraries are fabulous places for doing that kind of open-ended exploration, but I think there need to be ways to encourage students to do that—not for a grade—as well as to provide the raw materials for their research. I'm also wondering if one of the pedagogical techniques I adopted while teaching literature might also be adaptable to a library context. If I wanted to get students thinking a bit more laterally about a given text, I'd have them all look at it for a few minutes and write down an observation or two. Then we'd go around the room and each student would have to find a way to connect his or her own observation to what the previous student had just said. Something about the "Here's an observation; here's an observation; now connect them" structure always seemed to push the discussion out of familiar territory. I wonder if that structure might also work to encourage research exploration as well. And I'll stop there. Reader, what do you think? Not long ago, having realized that none of the other online to-read list options I’d been trying were really working out, I joined Goodreads. I like the ease of adding a book to one’s to-read or currently-reading shelves; I like the tagging; I like being able to specify what page I’m on; and I like reading other people’s reviews, and writing reviews of my own. What I wasn’t expecting to find was the “Quotes” feature. One can, if one likes, search for quotations from one’s favorite authors, save quotations to a list of personal favorites, add in quotations that nobody else has added yet, and give them descriptive tags. My first thought, when I saw all this, was that the commonplace book phenomenon had popped up in another place I hadn’t been looking for it. A lot of the most popular quotations on Goodreads are of the banal sort that one sees on greeting cards and refrigerator magnets (if I had a dollar for every time I’ve seen that “Dance like no one is watching” bit, I could retire tomorrow), but people have used the Quotes feature to collect all kinds of quotations, some of them wonderful. When I found it, I promptly spent several hours going through old notebooks and adding favorite snippets of prose and poetry to my Goodreads list. Once I started, I couldn’t stop. It makes me just a little bit happier when I see a passage I typed in getting favorited by other readers, like I’ve introduced someone to something splendid they maybe hadn’t seen before. Which, come to think of it, is perhaps how the compilers of the 19th-century commonplace books I’ve been looking at felt when they shared their extracts with friends and family members. Certainly the combination of “familiar quotations” and idiosyncratic personal tastes is something that’s become very familiar to me as I look at 200-year-old collections of quotations. His mind’s eye sees them quoted on the bottom third of a right-hand page in a (possibly) olive-bound book he read at least five years ago. When he does find them, it will be a great nuisance if no clue is given to their authorship. recognize itself, is grateful for not having done so earlier. Rosencrantz: Shouldn’t we be doing something—constructive? Guildenstern: What did you have in mind? … A short, blunt human pyramid…? Given Google Books’ well-known metadata issues and the inevitability of OCR errors in the data, I wouldn’t use the Ngram Viewer to make any substantial claims yet. * I don’t think it’s reliable enough to use as evidence. But I do suspect this is the first incarnation of the kind of tool that we’ll be seeing a lot more of, hopefully in more sophisticated versions backed up by corpora with more reliable date and publication metadata, and with more features for access to the corpora themselves. Thanks to my background research on the commonplace book project, I already knew that “scrapbooking” (as we now call it) took off in the mid-19th century and eventually became a more popular pastime than the keeping of commonplace books; the graph suggests something of the rise of one format and the fall of the other. I like how you can see Christina Rossetti’s reputation start to overshadow her brother’s in the early years of the 20th century, but they still track together throughout the subsequent decades. So: it’s not a perfect tool, it’s not as transparent as one would like, and ideally it should lead to questions we don’t already know the answers to, like my commonplace vs. scrapbook search above—but I’ll be very curious to see what develops out of it in a few years’ time. Incidentally, there’s now an Ngrams Tumblr blog, with an ever-growing collection of examples, some serious, some charmingly silly (like “new kids on the block” vs. “New Kids on the Block”: oh no, 80s flashback!). * Geoffrey Nunberg, who wrote the piece on Google Books metadata that I linked above, also wrote a thoughtful article of the Ngram viewer and the kinds of scholarship it might lead to. Well worth reading, especially for its cautions about the limitations of the tools as they currently stand. I've been dutifully writing Reverb10 entries for most of this month, but I'm not actually posting them because most of them fall into at least one of the following categories: 1) far too personal to share with the entire world, 2) far too mundane to share with the entire world, and 3) far too repetitive to share with anyone who doesn't want to watch me (metaphorically) pace back and forth across the same smallish patch of mental turf over and over. It's been a good tool for reminding me of which problems and preoccupations have been uppermost in my psyche of late, but that's not really matter for this blog. However, several of the Reverb10 prompts did lead to a New Year's resolution of a sort, which I'm posting here because I want to be able to remind myself of it later. What I noticed, after writing my way through a bunch of those prompts, is that I spend far too much time pondering the things that aren't working in my current life, and it doesn't help solve anything; it just makes bad moods worse. I don't know how to get rid of the broodiness; it's probably innate. But I can tell when it's happening, and I want to do something to derail it. So the resolution is this: When tempted to mope and feel sorry for myself, I will either make something beautiful, or read or look at or listen to something beautiful. * I want to replace my tendency to brood with a habit of making beautiful things. If I feel myself starting up the vicious cycle of ruminating over a bad mood, I will write something, or knit something, or design something, or, at a pinch, cook something more elaborate than I usually cook. If I don't have the time or energy for any of the above, I will listen to some opera, or pull one of my favorite poets' collected works off the shelf and start reading at a randomly selected page. And then I will blog about the results. Unlike a lot of my New Year's resolutions, I might actually keep this one. Probably because it's not so much a resolution as a strategy. * Or, perhaps, go somewhere interesting. Another thing that kept coming up in my Reverb10 entries: the UK trip was the highlight of my entire year, and I would love to travel a whole lot more. I blame Lady Penelope for my latest oddball knitting obsession. 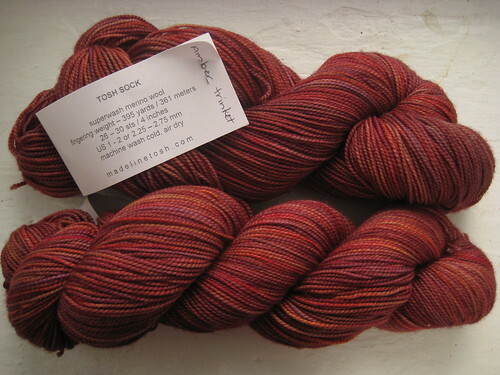 Had she not dropped the word "inscape" into this recent post about stranded knitting, I might not have gone off on the train of thought that began with "Oh, Hopkins! I should reread those poems again" and quickly led into "Wouldn't 'Goldengrove Unleaving' be a terrific name for some knitted thing?" and then "If I design a Goldengrove Unleaving pattern, I should do something similar for 'Pied Beauty' and 'The Windhover' and 'Inversnaid' and…"
I'm still at the stage where I fantasize a lot about designing knitting patterns but haven't yet actually tried to do it. But this might be the project that propels me into action. I have a fairly clear idea of what I'd like Goldengrove Unleaving to look like: a long rectangular stole, deep yellow with tinges of orange, more or less like the "Golden Glow" colorway in this yarn. I'm envisioning a leafy lace pattern, like Double Vine or Vine Lace or Bleeding Hearts, at one end, and a few trails of eyelet holes going up to the other end, to suggest leaves falling. "Pied Beauty," I think, should be a circular shawl. (Circular to make a pun on pi, of course.) And because the poem praises "dappled things," one would have to select the yarn with care: variegated enough to form patches of color instead of long streaks, and in colors that suggest the things in the poem. The only disadvantage is that I'm not sure what color Hopkins' finches' wings and trout scales would have been. But these things can be found out (and, in the process, I've noticed something I hadn't before about the way Hopkins evokes color without naming any actual colors except "rose" in line 3). And "The Windhover": I was thinking of a Fair Isle hat with a kestrel motif, but I see someone's already designed something like that. I may have to master stranded knitting, my as-yet-unconquered frontier, before I start in on my own version. As Hopkins would say: the achieve of, the mastery of the thing! I have a feeling that if I really wanted to get obsessive about Project Knitting With Hopkins, I'd read up on sprung rhythm and try to translate that into stitch patterns. But I suspect that that way lies madness. So I'll start with Goldengrove Unleaving instead. I got a huge kick out of working with this yarn, because I so seldom work with colors like this; when I’m knitting for myself, I favor gray, neutrals, and cheerful reds and oranges. I like purple, but vivid lipstick pink isn’t my thing. But the colors of this yarn were so splendid and silly and bright that I had a wonderful time just watching them unfold across the lace pattern that makes up most of the hat. Three cheers for frivolous hats! 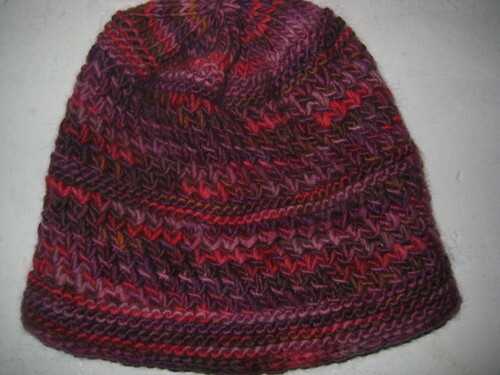 I may have to make one for myself; I have had the Jayne Cobb hat on my to-knit list for ages, after all. As for things I want to make: aside from the other two or three Christmas hats I’m planning for various relatives, the next two big things I want to make are a short story — the last one in the list in this post, actually — and a database to capture some of the information I’ve been finding during my research for the commonplace book project. And “clear some time” is the operative term, because both are substantial projects — the story less so, but given the pace at which I write when I’m not cranking something out for a deadline, it’s anyone’s guess when I might finish either. I've been neglecting the blog again. Too many things I might blog about (fun with productivity tools; gender in social networks; the latest outcroppings of my commonplace book project; when all else fails, random favorite poems), too little time. But a bunch of people I know in the blogo/Twitterspheres are doing Reverb 10, and I've been playing along as I write my daily 750Words brain-dump. Most of what I'm writing probably won't see the light of day; it's too personal for my blog standards. But we'll see. Today's prompt was "Moment": Pick one moment during which you felt most alive this year. Describe it in vivid detail (texture, smells, voices, noises, colors). While it may be cheating a bit to post photos when specifically prompted to write a description — particularly when the photo doesn't really do either the view or the moment justice — this was a really damn fine moment, and I don't want to forget it. I took this picture during the all-too-short Lake District segment of the Great UK Trip this summer, while standing next to the Castlerigg Stone Circle outside Keswick. The sun was just coming out after two days of rain and overcast, and it hit this valley just so. I stood there slack-jawed, staring at it for the longest time, surrounded by grazing sheep and picture-taking fellow tourists in equal numbers. There are some places that you just love at first sight, you know? Even if you only see them from a distance on a long walk where sooner or later you have to head off in the opposite direction. But someday I'm going back, and staying for much longer, and climbing those knobby hillsides every day. And if I ever develop a yearning for a quiet rural life, this is where I'm going when I retire. Inspired by The Little Professor's annual posts about scary Victoriana and James Hynes' Halloween reading and viewing lists (which, this year, includes a YouTube link to a filmed version of one of my all-time favorite ghost stories, M.R. James's "Oh Whistle and I'll Come to You, My Lad": w00t! ), here are a few recommendations of my own, just in case you need something to get you in the proper Halloweeny mood. "The Midnight Express," by Alfred Noyes. A story with a recursive twist like a Moëbius strip, about reading, about the uncanny (and how), and about the way some things are just inexplicably terrifying. The descriptions of the boy's candlelit room late at night, and the deserted railway station, have stuck in my head for years. "August Heat," by William Fryer Harvey. A very short, rather stark little story that packs an enormous punch in its last line. "The Beckoning Fair One," by Oliver Onions. One can read it as an allegory of the destructive effects of certain fantasies about "ideal" women; simultaneously, it's a very effective horror story. We're in the main character's head, and we see what's happening to him long before he does. One of those stories that make you want to break through the fourth wall and scream "Get out of that house NOW!" Film recommendation: The Eclipse, dir. Conor MacPherson (2009). A quiet, understated Irish horror movie with some unexpected satire DNA (the haunting takes place during a literary festival, and the movie alternates between scare-the-pants-off-you moments and sendups of the world of writers). I'm a bit of a wuss where movie horror is concerned, and parts of this were almost beyond my scariness tolerance level—but I kept watching, through my fingers, because Ciarán Hinds' performance is so moving and lovely. 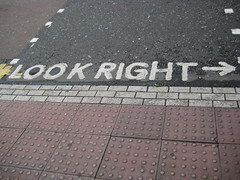 UK traffic is on the opposite side of the road from many other countries, and if you’re visiting from one of those countries, it’s all too easy to forget which way to look as you step into an intersection into oncoming traffic. So in a lot of places, you see these directional signs painted right next to the curb. I particularly appreciated the arrows, as I am one of those people who can’t tell right from left without stopping to think about it. A while back, I came across a blog post about a study that found intersection density—the number of street intersections per square mile, typically much higher in older, denser cities than in newer suburbs—to have a surprisingly high impact on overall walkability. It’s one of those things that aren’t immediately obvious but make a lot of sense when you think about them. The greater the number of intersections, the more possible routes there are, the less often pedestrians will have to take the long way around, and the easier it is to vary one’s route and avoid boredom. One caveat: I don’t know how safe the closes are after dark; I wasn’t out all that late while I was there. 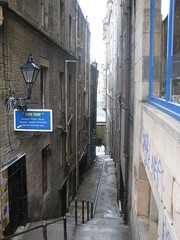 But during the day, I loved having a set of built-in shortcuts all over the city. It’s not that people don’t hike for fun in the States. But the UK has much more of a culture of recreational walking,* with a whole history of walkers’ associations and disputes over public rights of way. 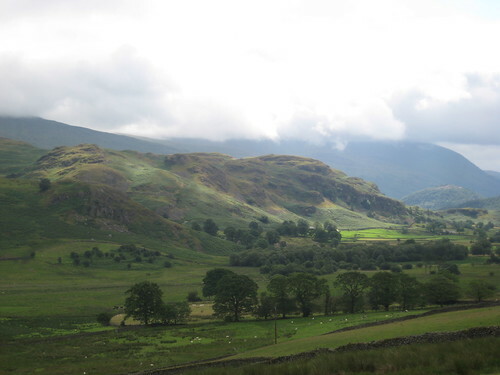 My time in the Lake District, an especially popular walking destination, made that clear: every town I visited had a tourist center that offered directions and sold Ordance Survey Explorer maps and Kendal Mint Cake, the hill-walker’s favorite snack. Outdoor stores were everywhere, peddling breathable clothing, sturdy boots, compasses, and mountaineering equipment. And I kept meeting fellow walkers of all ages everywhere. 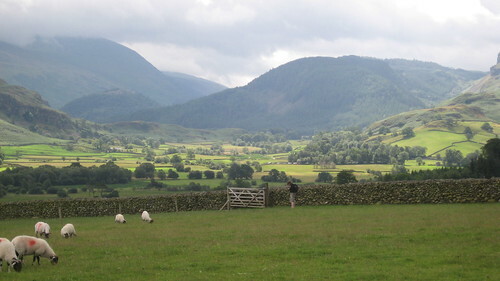 Most of all, I loved that I could walk right to the edge of a town like Grasmere or Keswick and keep going, on side roads or paths through fields, up the side of a fell or all around a lake, and on for as many miles as my feet could take me. Whereas on this side of the pond, if you want to go for a long semi-rural walk—at least in my part of the US—you generally have to drive there first. I . . . thought nothing of a daily constitutional from my hotel in Union-square to Central Park and back. Half a dozen times on my way, friends in carriages would stop and beg me to jump in. I always declined, and I really believe that they regarded my walking exploits as a piece of English eccentricity. I’ve had the exact same experience more times than I can count, only with much shorter distances than Collins’ five-mile Union Square to Central Park stroll.